Investigate the haunted barrow outside of Ivarstead. Could the barrow really be haunted? Offer to investigate Shroud Hearth Barrow after Wilhelm complains it might be haunted. Explore the barrow and track down the "ghost." Take Wyndelius' diary to Wilhelm for your reward. When visiting Vilemyr Inn in Ivarstead you may overhear the innkeeper, Wilhelm, warning Lynly Star-Sung about a ghost in the nearby barrow. 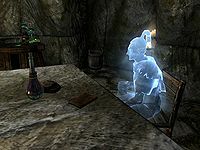 If you are intrigued and like a good ghost story, Wilhelm will inform you that Shroud Hearth Barrow, an ancient Nord crypt just outside of town, is haunted and warns you away from it as well. When pressed further, Wilhelm will confess to seeing the spirit and complain that the haunting is harming his business. If you volunteer to investigate the haunting, Wilhelm will think you daft and tell you of Wyndelius Gatharian, an adventurer who went to explore the barrow a year ago. Screams were heard in the night, and the adventurer was never seen again. Enter the barrow. At the first intersection, you might see Wyndelius' ghost through a locked gate to your right, asking you to leave. The first part of the barrow has no enemies, only several traps that you must navigate through. Head left to a room with four levers and pull the two middle levers (the ones closest to the door) to open the two metal gates. The right side lever triggers an arrow trap. In the next room, to the right is an apprentice locked door. Directly behind it is a pressure plate that activates a spike trap. It is, however, nowhere near the pressure plate so walking slowly over it will leave you unharmed. Beyond the spike trap is a booby-trapped chest. Moving back, pull the chain to open the next gate and continue on. There is a spike trap here too, but once again moving slowly over it will work. Eventually, behind an unlocked door, you will find Wyndelius. Wyndelius will attack you on sight, unless he is sleeping, which allows you to perform a sneak attack or a stealthy inspection of the room. If you kill him, his ruse is revealed; he is not a ghost at all, and his spectral appearance was due to a potion called Philter of the Phantom. On the table you will find his journal, which explains why he pretended to be a ghost. However, killing Wyndelius is not necessary to complete the quest; you need only recover the journal. Take the journal to Wilhelm and, in exchange, he will reward you with the sapphire dragon claw; the very item Wyndelius gave his sanity and life to possess. The claw is needed to explore the rest of the barrow which contains a word wall with a part of Kyne's Peace shout. The claw will be marked as a quest item until the player clears the barrow. If the barrow is left alone long enough to reset, Wyndelius' body will remain dead while replenishing a new bottle of Philter of the Phantom. On the PC, it is possible to use the console to advance through the quest by entering setstage FreeformIvarstead01 stage, where stage is the number of the stage you wish to complete. It is not possible to un-complete (i.e. go back) quest stages, but it is possible to clear all stages of the quest using resetquest FreeformIvarstead01. This page was last modified on 11 April 2019, at 02:50.